Though a species of limited biogeographical range (mainly in Atlantic and Continental regions) and thus potentially vulnerable to climate change, this plant is almost strictly a species of still waters rather than the rivers that are the focus of REFRESH. This plant is not in the IUCN red list and inhabits shallow bodies of brackish and freshwater such as lakes and bays. (In North America it is found along the Pacific coast, in the north and northeast portions, with disjunct populations in Missouri and Utah). Within Europe, it is native to the north, where its range includes Scotland, Poland and Sweden, but it is rare generally. The two main threats to N. flexilis appear to be eutrophication (because in eutrophic, high pH conditions plants cannot photosynthesise due to a lack of CO2), and acidification (plants appear unable to produce seeds in low pH conditions). N. flexilis is known in Scotland in National Vegetation Classification communities A13, A24a and A23 and in PalmerÃs Standing Water Types 3, 4 and 5. None of these are river habitats. Presence of invasive Elodea species has been considered as threats to N. flexilis, being sometimes out-competed by the invasive waterweeds. In the British Isles, N. flexilis can be found in water <1.0 m deep, but is usually found at depths of andge;1.5 m. These depth limits result from a number of factors, including light and exposure, and hence water clarity, suspended solids, algal growth and the properties of the catchment. N. flexilis appears to grow particularly in silty, organic, flocculent sediment or in fine semi-liquid mud with an organic content of 5-10%. The Northern Emerald is a relatively dark and small dragonfly which occurs in Northern Europe and at high altitudes in Central Europe. Increased temperatures, increased variability in lake water levels as a consequence of Climate Change and competition with southern species on habitats lead to a decrease of the species. Increased temperatures, increased variability in lake water levels as a consequence of Climate Change and competition with southern species on habitats lead to a decrease of the species. Warmer temperatures because of the climate change are predicted to favour the establishment of C. carpio. This non-native species is capable of rapid growth and have a high reproductive capacity involving multiple spawning strategies, leading to impacts such as detrimental effects through interspecific competition and the displacement of native fishes. A bio-engineering species, C. carpio is a vigorous benthic feeder whose foraging behaviour results in declines in submerged vegetation directly through uprooting or herbivory and indirectly through bioturbation and excretion. The species also induces the resuspension of sediments that could change water transparency from clear to turbid. Britton J.R., Cucherousset J., Davies G.D., Godard M.J. and Copp G.H. (2010) Non-native fishes and climate change: predicting species responses to warming temperatures in a temperate region. Freshwater Biology 55, 1130-1141. Perca flavescens eggs are extremely sensitive to UV radiation, and in a lake with low concentrations of dissolved organic carbon (which attenuates UV light), exposure to UV radiation was such that egg mortality was total . Climate change scenarios for in some regions (e.g. U.K.) predict that cloud cover will fall and exposure to solar radiation will increase . Experimental evidence implies that this could have negative implications for P. fluviatilis and other littoral spawners. Direct negative impacts of climate change on northern pike are unlikely because of this piscivore?s tolerance of relatively high temperatures and infrequent utilisation of deepwater areas where low oxygen levels are likely to develop, but indirect effects may occur through impacts on prey populations. The northern pike is often the top aquatic predator and frequently preys on salmonid-dominated fish communities. Climate change predicts that salmonid distributions will shift northwards and/or show decreases in local productivity. Although northern pike can changes its diet to non-salmonid introduced species, such as cyprinid and percid, changes in their relative abundances are likely to have significant consequences for northern pike foraging conditions, and thereby to an overall decline in their populations. Winfield I.J., James J. Ben and Fletcher J.M. (2008) Northern pike (Esox lucius) in a warming lake: changes in population size and individual condition in relation to prey abundance. Hydrobiologia 601, 29-40. Rutilus rutilus (L.) is a common eurythermal cyprinid, characteristic of productive lakes, ponds, canals and middle and lower reaches of rivers across much of Northern Europe and Asia. The fish can survive in temperatures from 4 to >30anddeg;C; growth, however, is restricted to water temperatures >12anddeg;C . Warmer water temperatures throughout the year, with an earlier spring and extended summer and autumn, will increase the scope for recruitment. Rutilus rutilus is likely to spawn earlier in the year , and YOY fish will forage with greater efficiency over an extended growing season. This will reduce the risk of predation and overwinter mortality . Adult R. rutilus may respond to increased temperatures by increasing growth, with associated increases in fecundity in female fish. 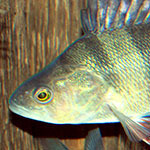 Rutilus rutilus can withstand low dissolved oxygen concentrations for short periods, even if water temperatures reach c. 30anddeg;C . Although clearly at risk if water levels fall significantly or if small rivers, shallow lakes and ponds dry out compared with many other fishes, R. rutilus should be relatively resistant to drought conditions. 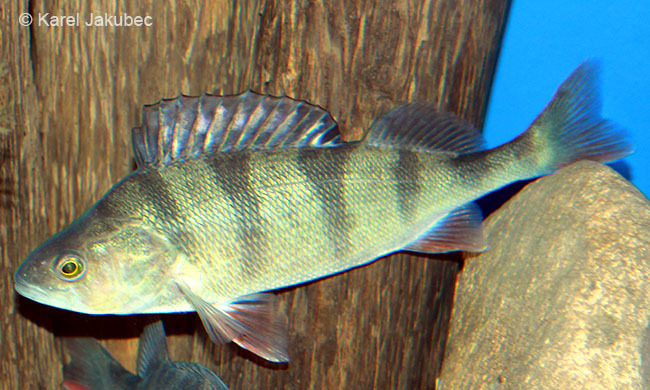 The zander (Sander lucioperca) is a eurythermal species distributed widely in Europe whose growth and recruitment success is correlated with temperature. The present northern distribution coincides with the July 15anddeg;C isotherm and is likely to shift northward with climate change. Successive year-class strengths and growth rates in northern environments are also likely to increase as temperatures increase. Increases in both abundance and size are very likely to have consequences for the competitiveness of resident coldwater-guild fishes if concomitant increases in lake productivity fail to yield sufficient ration to meet the needs of expanding populations of zander and other percids. Reist J.D., Wrona F.J., Prowse T.D., Power M., Dempson J.B., Beamish R.J., et al. (2006) General Effects of Climate Change on Arctic Fishes and Fish Populations. AMBIO: A Journal of the Human Environment 35, 370-380.